The billionaire investor Carl Icahn has launched a battle to topple the Yahoo board and replace its 10 members with his own slate of directors. Mr Icahn said in a letter to Yahoo that it was clear the board had acted "irrationally" in its dealings with Microsoft, which tried to buy it. Shareholders will now get the choice between the two boards at the annual meeting on 3 July. 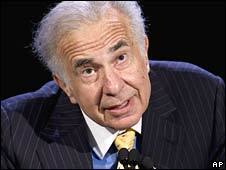 Mr Icahn wants to buy an additional $2.5bn worth of Yahoo shares. The manoeuvre follows much anger and criticism over Yahoo's decision, led by co-founder and chief executive Jerry Yang, to turn down Microsoft's $47.5bn (£24.4bn) offer to buy the company. Yahoo had wanted Microsoft to increase its bid of $33 a share to $37 a share. Mr Icahn said it was "unconscionable" that the firm had not put the decision to shareholders, saying the offer was a 72% premium to the value of Yahoo shares before the bid was tabled. "I and many of your shareholders strongly believe that a combination between Yahoo and Microsoft would form a dynamic company and more importantly would be a force strong enough to compete with Google on the Internet," Mr Icahn said. Microsoft has already said that, contrary to rumours of it possibly making another move later in the year, talks with Yahoo are over. Mr Icahn has reportedly already spent more than $1bn to buy about 50 million Yahoo shares - a 3.6% stake - allowing him to increase the pressure on Yahoo's board.